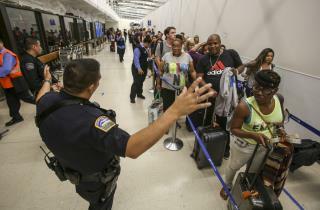 (Newser) – Reports of a gunman opening fire that turned out to be false caused panicked evacuations at Los Angeles International Airport on Sunday night, while flights to and from the airport saw major delays, the AP reports. A search through terminals brought no evidence of a gunman or shots fired, LAPD spokesman Andy Neiman says. The reports were spurred by loud noises only, and police were still investigating to find the source of them, he adds. Airport officials said that a person wearing a Zorro costume was detained during the incident, but it wasn't yet clear whether the person had any connection to the evacuation. People wear costumes in NYC and LA. Surprised that even raises an eyebrow or suspicion in either jurisdiction.